A couple days back I decided I'd make some more refrigerator magnets with some of my painted papers. I ordered 200 3/4" magnets off Ebay and they came in yesterday. Cut out the paper backing (this is heavy scrapbook paper ... the type from the old vintage paper photo albums). Glue the paper, front side to the back of the glass gem & allow to dry for a couple hours. 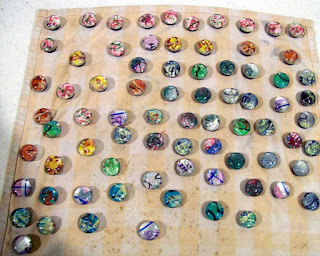 Glue magnet to the back of the paper coated glass gem and allow to dry for a couple hours. I'm using clear acrylic caulk as the adhesive as it's more durable (not water soluble). I plan on using them as give-aways with art/craft shipments and will put some up for sale in the upcoming art/craft sales. I like the looks of these. These are some heavy duty magnets. 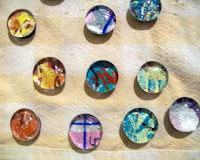 I'd set them out on the table and they slide together; something not highly desireable while they are in the drying process. I ended up having to put them on a dish towel so they couldn't slide. Think I made about 70 today; I'll create some more tomorrow. Great looking magnets. I have made some of these myself in the past for personal use. Good luck once you post them up for sale.